Season One: He's Listening. Therapist Paul (Gabriel Byrne) exhibits insecurities while counselled by his therapist, Gina (Dianne Wiest), but great confidence with is own patients: a doctor (Melissa George), a Navy pilot (Blair Underwood), a teenage gymnast (Mia Wasikowska) and a couple (Josh Charles and Embeth Davidtz).Season Two: Talk to me. 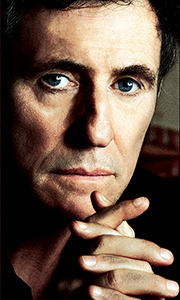 Set within individual psychotherapy sessions, Dr. Paul Weston (Gabriel Byrne) continues his o.. In denial. In conflict. In love. In Treatment is set within the psychotherapy sessions of five patients. The first ever HBO half-hour drama features features Paul (Gabriel Byrne), a therapist who exhibits great insight and confidence when treating his patients, but crippling insecurities while counseled by his own therapist, Gina (Dianne West). Adding to his list of growing concerns his wife Kate (Michelle Forbes), is overcome with feel..
Set within the highly charged confines of individual psychotherapy sessions, In Treatment centers around Dr. Paul Weston (Gabriel Byrne) who recently divorced his wife Kate and has moved from Maryland to a brownstone in Brooklyn, New York. Rebuilding his practice while wrestling with some of the demons he left behind – including a lawsuit filed by the father of Alex, a patient who died last year – Paul takes on several new patients and ..
Set within the highly charged confines of individual psychotherapy sessions, In Treatment Season 3 continues to center around Dr. Paul Weston (Gabriel Byrne) who is coping with the aftereffects of his recent divorce, as well as his move to Brooklyn to continue his practice. In the midst of new emotional and physical challenges (including hand tremors he fears might be the onset of Parkinson’s Disease, which killed his father), Paul will..